What was euphemistically called the "shower bath" appears to have been first introduced into the New York State penitentiary system in April 1842 at Auburn as an alternative to flogging but eventually its use spread to Sing Sing and Clinton as well, especially after whip punishments were outlawed in 1847. 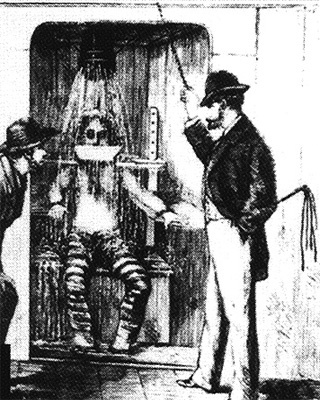 The configuration and application varied but the common features involved cold water from above forcefully flowing upon a seated and strapped inmate, often wearing a bowel-like device attached to his neck under his chin. It would fill to a level where he would be ingesting water if he opened his mouth and would be breathing in water through his nose if he didn't keep stretching his neck to avoid literally drowning in the shower. Sometimes ice was added to make the water freezing cold. Sometimes the flow of the water was painfully forceful. The pratice was ended at Auburn Prison in 1858, after inmate Samuel Moore died reputedly from the effects of that punishment. Nevertheless its use continued at least for a while at Sing Sing. In 1860, some 161 such showers were reported. NYCHS webmaster notes beneath image. NYCHS board member Judy Berdy, who is administrator at the Skirball Center for Adult Jewish Learning at Temple Emanu-El, suggested NYCHS website readers might be interested in the subject matter of Ron Arons' April 25 lecture sponsored by the Bernard Museum of Judaica & Stettenheim Library at Temple Emanu-El. Judy also is president of the Roosevelt Island Historical Society. This presentation is a follow-up on her suggestion. Elizabeth F. Stabler, Temple Emanu-El librarian, provided the photo postcard announcing the lecture. Ron Arons, who designed the postcard, took the photos of the guard tower and Cell Block A. He credits the "illustrations of the various tortures" and the electric chair photo to "the Ossining Community Center." The format for this web presentation was designed by the NYCHS webmaster whose own research notes appear on the left below the image.